Welcome to the October 2018 release. If you have come from Jennifer McGuire's blog then you are right on track. You can start the hop over on the Altenew Card Blog. Today's release got me all excited for Christmas. I love documenting this period but I don't necessarily have the time to do a lot of crafting so preparing my album beforehand is my go to method. This year I'm going for super simple: a tiny album spruced up with embellishments and sentiments. You can learn more about the cover on the Scrapbook Blog. For the inner pages I used the Brilliant Baubles Stamp and Die set to create embellishments which I popped onto small squares. The patterned paper comes from the Altenew Celebration Kit. You can see how I created the embellishments in the video below. Here is a sneak peek of my layout with the potted plants which can been seen on the Altenew Scrapbook Blog. I'm also giving away a 30$ gift voucher. Just leave a comment in the comment section here or one YouTube and I'll pick a lucky winner on October 16th. These are some beautiful designs! I love how beautiful and creative these projects are, and I cannot wait to try them myself! I love your color combination too! OMG I love this release! How does everyone keep coming up with these awesome ideas?!?!? Such a pretty album. Thanks for the video too. Love all the outside-the-box projects! what a great scrapbook page. great idea to have your embellishments made up in advance. Gorgeous makes, I especially love that layout - it's so beautifully designed! And the colours are fab, too! Your album is gorgeous!! Great idea on getting started before hand. Cute scrapbook page! Your things are beautiful! Thank you for sharing your creations! Love your project. Th wreath is my fav in this release. Super cute project, love the concept and the wonderful stamping! You are so creative and I do love this release. Fantastic projects, that layout is so beautiful! What a great idea! Wish I was that clever and organized! I will be lucky to even get my Christmas cards made let alone mailed. Love your book and the ideas you've presented. Always blown away by the creativeness of each of the blog hop participants. love how you used these new stamps on your project - so versatile!! I love the plants in pots. Very creative! Love your scrapbook layout. :) So pretty. So clever and pretty! Thanks for the video too!!! Love the layout and album! This is a great idea. Great new release, too! This is so pretty. I especially loved the colors you choose for the star on the title page. Beautiful! As always fabulous creations Lilith! Love the pocket cards! Thanks for the inspiration! What a great release! So pretty. So pretty and a big help to get started on organization! Such a lovely mini album--love your colour combinations. Your design just says it all. Looking forward to seeing more pages in your mini album!! What a cute idea! I love the colors and the stamping! Cute scrapbook ! This s a wonderful release! I really love the house plants! So cute! Oh what a beautiful and sweet scrapbook cover and embellishments! 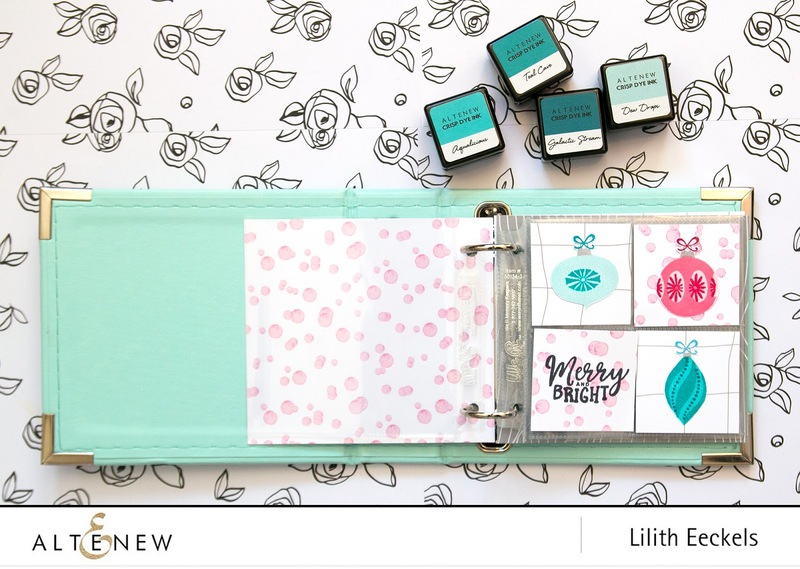 Excited to swing by the Altenew Scrapbook blog to see more of your gorgeous layout too! Gorgeous wreath and the ornaments are very pretty!! I love those Christmas ornaments!! Love your layout and album! What a cute little album and I like the plants on the layout. Brilliant idea! Your mini album makes me want to scrapbook. I love how you're pre-planning your holiday layouts. The layered baubles are adorable and the colors are so pretty! The layered star on the first page of your album is beautiful! I really like these layered sets. The mini scrapbook would be a wonderful gift idea, as well! Amazing!! Love the album idea! What a lovely, soft color palette you've chosen. It goes perfectly with your album, as do the patterned papers you used. I appreciate seeing a sweet, simple project like this; it's a good reminder that I don't have to do ALL THE THINGS to make something pretty and meaningful. Thanks for sharing! How cute & colorful are those ornaments? I love them! Those are what I want to get when I win. I love Christmas, I love ornaments & I love ornament stamps. Those will fit the bill very nicely, thank you very much! I love all those plants! We used to have a plant table our living room & all of those plants or at least some of them used to be on our table. I like all the shades of green you used too. When I make leaves on a tree or just leaves in general I also use different shades of green. Why shouldn't a card be colorful? Thank you for showing us your colorful scrapbook pages & for giving us the chance to win something. Fantastic projects, as always. Love this release. Love the wreath stamp. Your album cover is lovely. 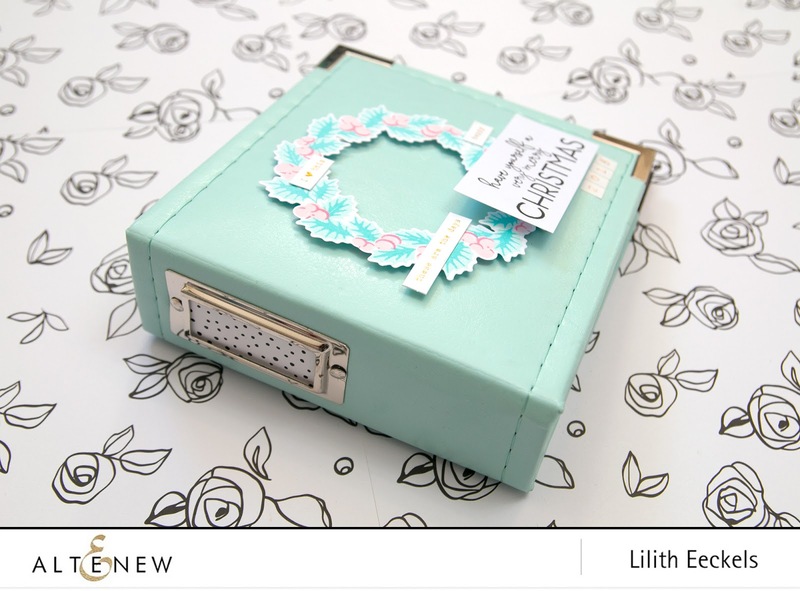 DELIGHTFUL album Lilith, LOVE your cover and pretty accent panels! Thank You for sharing your video, it was MAGICAL watching the inky layers of the baubles building delicate detail and dimension! 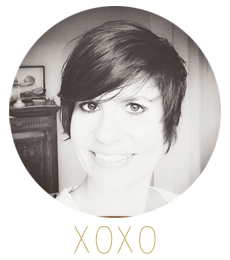 PS - sweet sneak peek of your layout (heading to the other Scrapbook blog soon). Love your layout. Fabulous release as always. Beautiful release and lovely projects. The tiny album embellishments are so pretty. Thanks for the inspiration. I really like your examples of using stamps and dies with a scrapbook. Always love your creativity! Beautiful projects. I am making a mini album for my granddaughter for Christmas and this has given me inspiration to use my floral stamps/dies to enhance the pages!!! I really love the color selection for those ornaments! What a great creation... can't wait to check out your scrapbook page. I love that potted plant set. Really lovely project, thanks for sharing the beauty of the ornaments. Beautiful baubles for your mini album and I LOVED the accompanying music for your video! Who is playing??? potted plants is amazing! What a cool idea to make something for the albums outside cover!! Very cool! Your album is gorgeous!! Love the ornaments, and your color choices! Lovely idea to prepare the album beforehand, pretty colors too! Enjoyed the video. The plant layout is beautiful. Great design ideas! The Potted Plant bundle is going on my wishlist. Not only are these so cute, but they can be used for so many occasions. Wonderful project! I’m so excited about this release! Oh how I love those pages you made for the album! Those colors are amazing together for Christmas and I can even see a quick card with those! Love the beautiful album. Great release. I love the color combination. This release is amazing! Thank you for sharing your talent with us! What a great idea! I love getting things ready ahead for Christmas. Love the fun ornaments. Sweet card with the potted plants, Lilith, and I love your mini album design! So cute! The Brilliant Baubles stamp set looks like so much fun! You’re album cover is adorable! Very cute project. Love it! Thanks for sharing. Your album would make a great Christmas gift. Thanks for the inspiration! Love this mini album & the way you decorated it! I have not done any scrapbooking yet because it seems like a daunting task. I may actually try this mini album this year & see if I can get my memories down. TFS! This is a really cute mint Christmas album. I would have never imagined a Christmas album in mint. I love this idea of documenting Christmas. It's the first Christmas I will have with my grandkids in four years so I think this would be perfect. Thank you for the inspiration. I love your ornaments. What a cute little album! Definitely less intimidating than creating a big book! Your layout is lovely, and I can't wait to see what you do with the otted plants! Love the ornaments in this set. Great details! Thank you for sharing the Christmas album. It is beautiful! 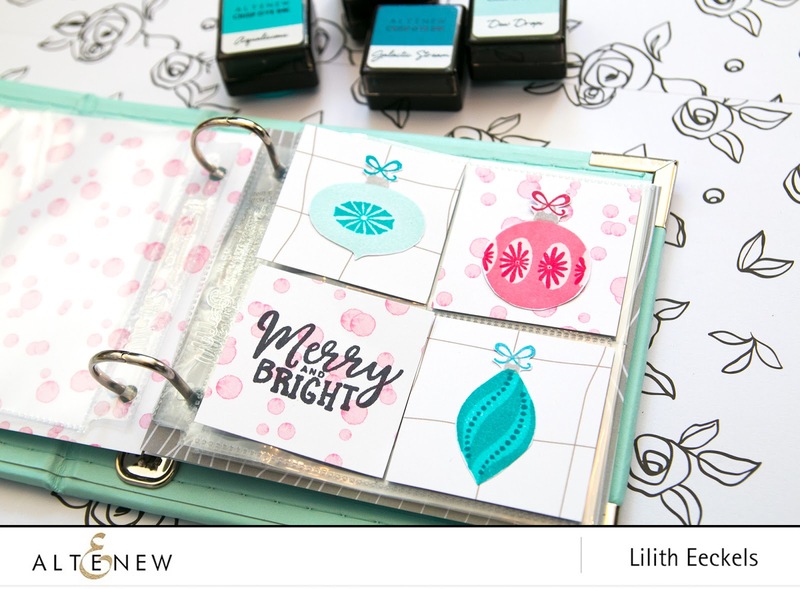 The Peaceful Wreath Stamp & Die Sets are my favorite part of the Altenew October release. A great idea, thank for sharing! I seem to be drawn to all the green, earthy stamps. I just love these. This is a great release by Altenew! My bank account says “ouch!” In advance. One of the best things about this release is the selection of sentiments. I love the one you used, "Start each day with a smile on your face." What a great reminder on a lovely card. Demo with the different colors and ornaments. It really gives us a fuller picture of the set. Can’t wait to see your layout because the sneak peek is amazing!!! 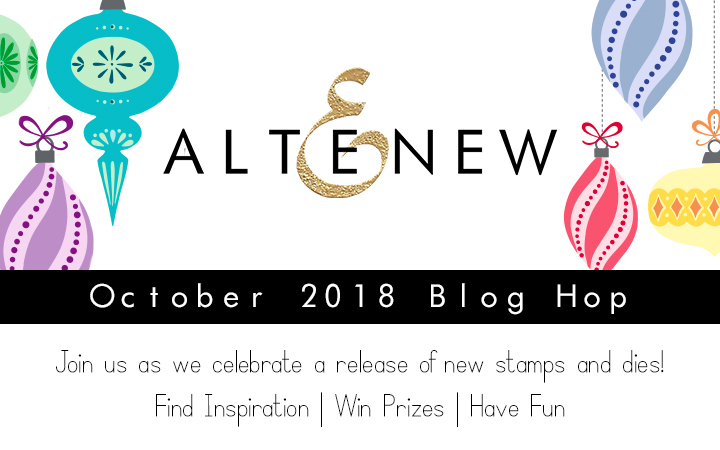 I get excited with each Altenew release - thank you for sharing your artistic interpretation of the new items! Beautiful products and great projects! I love your card designs. Thanks for sharing your time and talent with us. Love this release - awesome designs! What a beautiful mini slum. Very smart to keep it dimple and make ahead of time. Looking great! Love the pretty colors you chose for your projects!!! Sometimes we forget that stamps are very versatile and can be used for other things than cards or tags. It’s nice to see projects like your beautiful album to remind us there are other things we can do with our stamps. I love the potted plants too, it’s different. I like it!! You knocked it out of the ballpark. What gorgeous projects! Fabulous project! I love the idea of getting ready to document the holidays! Great idea and I understand what your talking about. thanks for sharing. Great way to use the Baubles. I love your potted plant layout! The different green tones are so pretty especially when they overlap, great job! Gorgeous collections and projects!!! Your work is amazing!!! I love the wreath on the front of your mini album. The colours match the album colour so nicely. I also love the colours in your potted plants layout. An interesting idea to make up embellishments for your Christmas layouts ahead of time. That's thinking ahead and being organized. Your ornaments are lovely and Will make a gorgeous page I'm sure. That brilliant baubles set is one of the the new release. I love your exciting ideas. I can't wait to try them. Love the soft aqua color of the book. What inspiring samples! Fun new release. Wow! What a great idea! The perfect gift for someone special! Oh my goodness! What a wise idea to have your mini photo album all prepped before the holiday season. That's really, really smart! I love the way you interspersed the baubles amongst the pages too. Thanks for sharing! I'm loving that wreath and the potted plants. Great projects! Someday I'm going to start scrapbooking again, so thanks for the inspiration! Love your christmas book! What a fun way to use these stamps. Thank you for sharing your beautiful samples today. Great ideas....this is such a pretty release. Thank you so much. What a wonderful idea -- love that album.